My birthday isn’t actually until Wednesday, but I did most of my celebrating over this past weekend. This year the weekend before my birthday coincided with the larger of the two street festivals that happen in my neighborhood every year, HonFest. If you’re not from Baltimore and have no idea what HonFest is think your typical street festival with food, vendors, and music but with people dressing up like they’re in John Waters’ Hairspray. There are also contests for Baltimore’s Best Hon in various age groups. The pre-school age one is usually the cutest, though we didn’t make it out in time to watch that this year. We met up with a couple of friends on Saturday afternoon and walked around the festival for awhile. It was a great day for it. Usually by the time HonFest rolls around Baltimore is already stupidly hot and humid, but this year was one of only two years that I can remember that the weather has been really great for it. Saturday night I made my husband take me to see Kacey Musgraves, Alison Krauss and Union Station, and Willie Nelson at Merriweather Post Pavilion. As I already mentioned the weather was gorgeous on Saturday, so it was the perfect night for an outdoor concert. It was quite pleasant out with the sun up, and then after it went down it was perfect a perfect barefoot blue jeans night as Jake Owen sings. Chilly enough to be wearing jeans and a hoody, but still warm enough that I had no shoes on. Of course not everyone thought it was so pleasant. I was cracking up when Alison Krauss came back out on stage to sing at the end of Willie Nelson’s set she was all bundled up in a winter coat. My husband makes fun of me because he says I’m always complaining that it’s cold when it’s not, but I said hey at least I’m not that bad. The concert itself was great. I had gone back and forth about whether or not I wanted to go. I really wanted to see Kacey Musgraves and Alison Krauss and Union Station, but I just don’t care that much about Willie Nelson. Since he was the headliner I didn’t immediately jump on it, but eventually decided it would be a fun birthday weekend activity and even if I’m not a huge Willie Nelson fan it would be cool to see a music legend in concert. As suspected I loved Kacey Musgraves and Alison Krauss and Union Station, but was not super excited about Willie Nelson. Kacey Musgraves has been hitting it big in country music over the past year or so. If you listen to country music you’ve probably heard her songs “Merry-Go-Round” and “Follow Your Arrow”. I’ve been wanting to see her for awhile, but I remember last summer she was touring with some country artist that I don’t care for. I don’t remember which one. There’s a whole collection of what I think of the bro country artists, which are all the male artists that sing seemingly exclusively about drinking and trucks or at least that’s my impression from the singles they release. I don’t much care for them and I generally can’t keep straight which one of them sings which song. At any rate I was happy to see Kacey Musgraves touring with people I also wanted to see. I enjoyed her set a lot and look forward to seeing a lot more of her in country music over the years. My husband said he didn’t think she fit with the rest of the bill, but I said haven’t you learned anything from watching Nashville? You send the young upstart out with the veterans so their fans can learn about her and become her fan too. She definitely did have a bit of a different vibe though. Her set was very dressy with a bunch of stuff in the background including neon cacti and some lighting tricks during the set. Alison Krauss and Union Station on the other hand had nothing on stage with them except their instruments as did Willie Nelson aside from a giant Texas flag hanging in the background. So yeah a bit of a different mindset there. As the young person on the tour though she was surprisingly the last of all the people on the stage who pulled out their cell phone to record the last few songs of the concert when everyone was back out on stage with Willie Nelson. All of that cracked me up. I love seeing musicians, even veteran ones, excited enough by the people they’re getting to play with as well as the audience that they want to record it. Alison Krauss and Union Station’s set was flawless. I love her voice so much. She also has a little understated wit. I told my husband their set was the anti-Jackson Browne. We saw him a few years ago and he played exactly zero of his hits. I’m still kind of mad about it. At any rate, Alison Krauss and Union Station did the exact opposite. They have had a long 24 year career together, so they obviously have an extensive catalog of music to work from. I would expect them to play some of their hits, but certainly would not expect to hear all of them. Yet that’s what they played. If the only songs you know by Alison Krauss and Union Station were ones you’ve heard on country radio or from the O Brother Where Art Thou soundtrack, then you heard what you knew plus obviously some other stuff. I loved them and would gladly go see them again any time. Then there was Willie. I’ve never really sat down and listened to a Willie Nelson album, so I wasn’t sure how many of the songs I would know. Turns out that as a country music legend who has written a ton of songs that have become country standards I have picked up on a lot because I knew the majority of songs that he played. It was cool just to say I’ve seen him and his legendary guitar “Trigger” with it’s many signatures and hole worn into it from over 40 years of playing on it. However, at 81 years old Willie Nelson is not really in his prime anymore. He almost spoke the lyrics to his songs more than he sang them, and he wasn’t particularly engaging. He definitely lost a number of people sitting around us, who left partway through his set. By far the best part of the set was the last four songs when he had Kacey Musgraves and Alison Krauss and Union Station come back out on the stage and sing with him. That part of the show was a lot of fun, and is the kind of stuff I live for with live music. Then that was the end of the show. There was no encore, which was weird to me since I couldn’t even tell you the last concert I went to where the headliner didn’t come back out for an encore. I didn’t especially want him to, I just found it surprising since encores really aren’t that anymore they’re just an expected part of concerts. All in all it was a good concert and I’m glad we went. Sunday I invited friends over to have some birthday cake with me. I really hate planning stuff to do for my birthday. I always want to celebrate it with friends, but I hate trying to figure out something to do and trying to wrangle my often not great about RSVPing friends if I plan something where I need to know if people are going to be there or not. Thanks to medications I take I haven’t been able to drink in many years, so just saying something like come hang out at this bar or something like that doesn’t really appeal to me. Thus I’m always trying to come up with ideas of low key things that don’t take too much planning on my part. I stress out about it every year anyway including this year, which was about as simple as it gets. I should probably just give myself a break and enjoy my birthday by not doing anything next year. At any rate since it was HonFest weekend, and we live a block away from where that happens I told people to just drop by my house between 4 and 6 on Sunday for some birthday cake after they were done enjoying HonFest. Of course when I made the plans I failed to realize that it was Father’s Day since I have no kids and my dad lives on the other side of the country from me. I lost a lot of people to Father’s Day plans. I did wind up having a decent turn out though and we put a serious dent in the cake. Though there is still plenty left for me to enjoy birthday cake for the rest of the week. I usually like to bake, but decided I didn’t want to have to bake my own birthday cake this year. 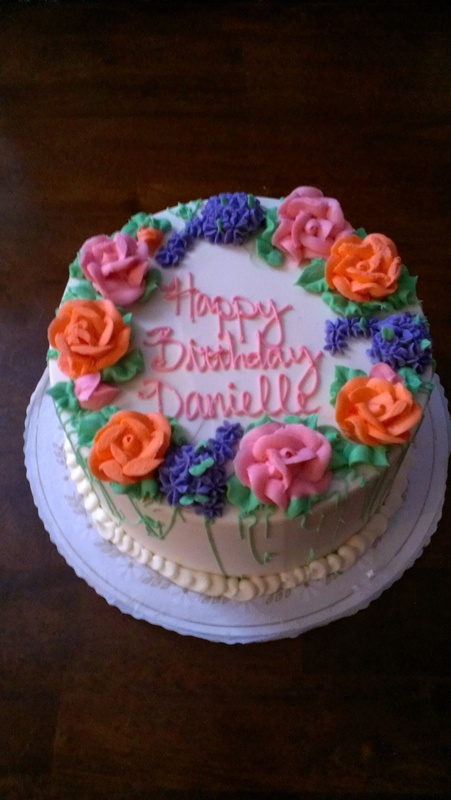 Instead I ordered it from the Baltimore Cakery. The one I got was a 4 layer chocolate cake filled with dark chocolate ganache and cookies and cream buttercream icing. It was tasty. I amused though by how many people said this is good, but I’m really sad you didn’t bake something because your cakes are the best. I also decided that if I was going to go completely little kid birthday with only a birthday cake I was going to kick it up a notch and make some sherbert punch too. I took myself back to my childhood and made some good old punch with pineapple juice, Sprite, and rainbow sherbert. It’s as simple as that, but oh so tasty. I also provided some rum and vodka for people to make it adult punch if they wanted. All in all it was a fun birthday weekend. This past weekend was pretty fantastic. 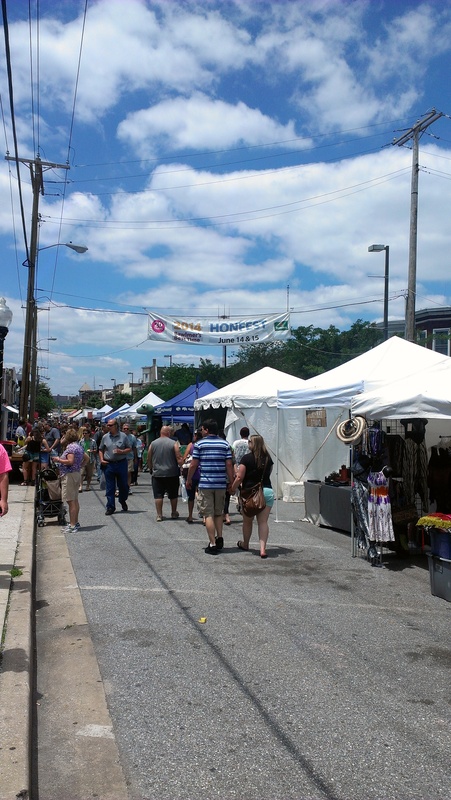 It had a lot of good things in it and the weather was just about as great as Baltimore summer weather gets. I wouldn’t say that Saturday morning’s activity was fun exactly, but made me feel good about life. Sadly my friend’s house was involved in a fire the previous weekend, so this weekend a bunch of us went over to see what we could help her salvage, clean it off, and then pack it up for storage until she has a permanent new place to live. Obviously it’s a horrible situation, but she’s been amazing through the whole thing. Her generally positive attitude about life has carried over through this whole ordeal. I on the other hand imagine I would be lying on the ground curled in the fetal position crying if I was going through this. It was also great to see a group of my friends come and work together to help out, even though I’m sure it was the last thing any of us really wanted to be doing on a Saturday morning. My favorite was the exchange in Facebook comments where one friend said he was going to come, but now then he saw the time.. He said it was too early, so he was out. Then he commented again and said that his wife asked him what he was going to be doing. Sleeping in his bed that didn’t burn down? So then he felt guilty and said he was back in. We got as much as we could done in about 3 hours, so it went pretty quick. It was also an education for me in smoke damage. I was really astounded at how insidious it is. Even just leaving the boots I was wearing in my bedroom for a few hours had my bedroom reeking like smoke. Saturday evenings activity was on the actual fun side of things. I went with a friend to see The Fault in Our Stars. We go see all the big movies based on popular YA novels together, so of course we had to see this one. I know the book is a little polarizing with it seeming that people either loved it or hated it. I was one of the people who loved it, so I was interested to see the movie even though I’m not the biggest Shailene Woodley fan. I don’t know why because I’ve actually liked her performances in every movie I’ve seen her in including this one, but I kind of groan every time I see her cast in a property I like. I may have problems. Anyway, the book of course was better as it always is, but I think they did a great job with the movie for the most part. It definitely made me cry more than once. It was also one of those instances where having already read the book made me have reactions I wouldn’t have otherwise. I spent the whole first half of the movie (spoiler) dreading the moment they were going to meet Peter Van Houten because I knew what a jerk he was going to be, and they were so super excited the whole time. I thought they did an admirable job adapting it. Sunday my friends had a backyard BBQ featuring a live performance by the Bumper Jacksons, who describe their music as country swing, roots jazz, and street blues. 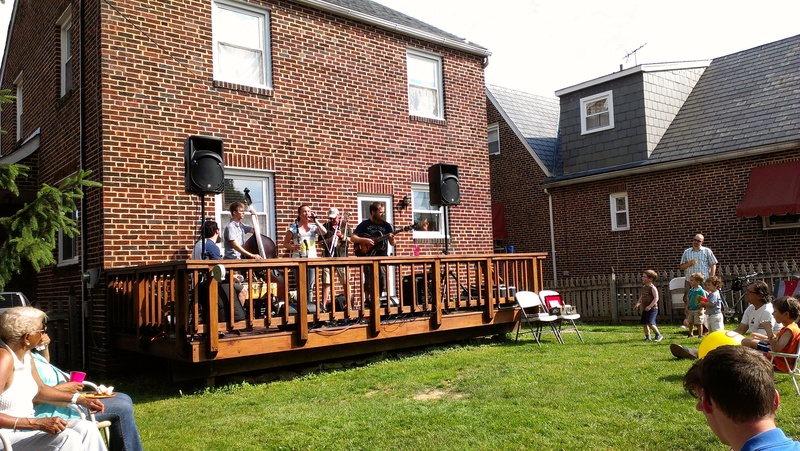 The Bumper Jacksons had a Kickstarter campaign to support the funding of their newest album, and my friends gave at whatever level got them a concert performed in their backyard. My friends smoked up a delicious brisket for the occasion and then everyone else came with sides and desserts. 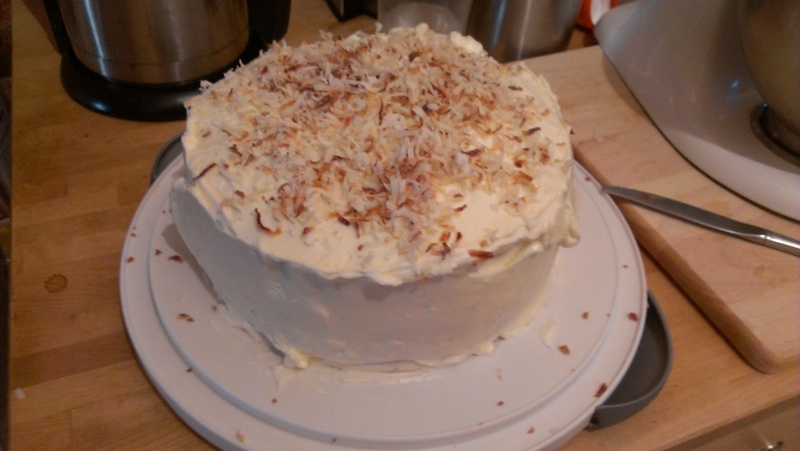 There were an insane number of desserts, including the pina colada cake I made. It was yet another entry from my Booze Cakes cookbook, and it was once again delicious. That cookbook never lets me down. It was a really great afternoon. The music was fun, and you know how much I like live music. It was awesome to sit outside with friends and enjoy some great food and music, while watching little kids dance around. It was like all the things I love about going to The Newport Folk Festival except it was in my friends’ backyard. We unfortunately had to cut out of the concert a little bit early because it was our final show of the season at The Hippodrome. We had tickets to see Sister Act, which I was not horribly excited about going in. I am really, really tired of all these musicals they are creating from movies these days. I feel like it’s so rare for their to be an actual new musical these days. Everything is either based on a movie, a revival, or a jukebox musical. I did not have high hopes for this one at all, but I was very pleasantly surprised by it. I actually liked it quite a bit. It was funny. I enjoyed the music because I’m a sucker for some 70s disco and R&B, which were the undertones for much of the music in this show. I don’t think I’ve been as surprisingly delighted by a show that I had low expectations for since Dirty Rotten Scoundrels. So it was a good note to end the season on. I of course then had to come home and stay up late to watch The Tony awards. It was a little less fun that I couldn’t really play with all the people in my Twitterfeed live tweeting the awards because I was 90 minutes behind. I can’t say much for most of Hugh Jackman’s hosting this year, sadly. I still have no idea what his entire opening number was supposed to be. At any rate I enjoyed all the performances from the various musicals on Broadway right now. As always it makes me realize how many more shows I wish I could see. Aladdin has been on my radar for awhile. My friends and I were obsessed with that movie when it came out, and the guy I was dating at the time, which was my Freshman year in high school, and his fellow theatre nerd friends actually plotted out their own Broadway version of the show way back then. So now I am really amused by the fact that it’s actually happened. I can at least tell you the act break does not occur in the same place they had it happening. I lost touch with all of those people long ago, but I have to wonder if any of them have seen it. I would also really like to see A Gentleman’s Guide to Love and Murder. I don’t have any trips to NYC officially on the books at this point, but there’s some potential talk of at least one trip so we’ll see what happens. It was really a fantastic weekend, and I look forward to hopefully having many more like it. Wednesday night I went to Rams Head to see The Head and the Heart. I had seen them there almost exactly 2 years ago. I remember because my friend Kristen was with me along with some other friends and she was hugely pregnant at the time, but not as hugely pregnant as she is right now which is why she couldn’t join me this time. I joked with her that I go to see them every time she’s pregnant. Anyway, when the tickets when on sale for this concert I was happy to see that Lucius was the opening act, and they are someone I know and like. Last time I saw The Head and the Heart at Rams Head the opening acts were let’s say not great. Lucius however was excellent. If you are not familiar with them they are a band from Brooklyn that I would classify as kind of synth pop. They also have lots of percussion going on, which I enjoy. Let me digress for a minute. I am entirely fascinated by band dynamics, and really music in general. I have no musical talent so I can’t even contemplate how one even thinks about writing a song. Then you add in a full band. How do you decide what kind of music you want to play? What kind of image if any are you trying to convey? Lucius had me thinking about these things last night because they are very stylized. The two lead, female singers dress in matching outfits and have both coiffed their bleach blond hair into the same hairstyle (or maybe they’re both wearing wigs), and the 3 gentleman were all wearing sleek, matching suits. It’s a very interesting choice. Stuff like this fascinates me. Anyway, I enjoyed their performance a lot. I loved that they did a little mash-up of Whitney Houston’s “I Wanna Dance with Somebody” with “Turn It Around”. That was lots of fun, and it’s stuff like that that makes me adore live music. They’ll be playing The Newport Folk Festival this summer, so if their set doesn’t conflict with someone else I want to see that I haven’t seen recently I’ll happily see them again. And speaking of reasons why I love live music The Head and the Heart’s set from last night was a perfect example. Things may not always get to go as planned, but that’s half the fun. And it means you get to experience things you wouldn’t otherwise. Jonathan Russell who is one of the lead vocalists messed up his voice somehow, and so couldn’t sing very well. As a result Josiah Johnson took over lead vocals on some of the songs he doesn’t usually do lead on. It gave the songs including probably their biggest hit to date, “Lost in My Mind” a different feel. The other big thing that happened as a result is that for the beginning of their encore the bassist, drummer, and keyboardist did not come back out. Instead Jonathan, Josiah, and Charity Rose came out armed with only an acoustic guitar among the three of them. They passed it around playing and each took lead vocals on one of their slower, quieter songs so that Jonathan’s voice could keep up. It’s something they said they never do, though for all I know they could be doing it at every show on this tour. Either way it was lovely, and I’ll take their word for it that it was a special experience. It was a great show and I look forward to seeing them again in the future. Maybe my friend Kristen will have another baby in two years and I can seem them again then. I was feeling really down about life and the world earlier this week. Over the last week or so I was reading and watching a lot of things that were weighing very heavy on my heart. I read Ta-Nahisi Coates article in The Atlantic “The Case for Reparations”, which gets into all the horrible things that African-Americans have endured in America. I followed that up by watching “The Normal Heart” on HBO, which is a movie adaptation of Larry Kramer’s play about the beginning of the AIDS crisis and how much it was ignored and how horribly early AIDS patients were treated because it was viewed as a gay disease. Then a few nights later we caught up with a Frontline from a few weeks ago about the prison system in America and what a revolving door it is and how there are better ways we should be dealing with things that land many people in prison rather than incarcerating them. In addition to watching these super uplifting things I was also reading “The Short and Tragic Life of Robert Peace: A Brilliant Young Man Who Left Newark for the Ivy League” by Jeff Hobbs. I had an advanced reader’s copy, but I would recommend reading it once it is released in September. It’s the heartbreaking story of a brilliant young man who against all odds went to Yale University and yet could not overcome his past ending his life in tragic fashion. On top of that I spent the week reading hundreds of tweets filling my feed with the hashtag #yesallwomen detailing all the horrible things that women have to deal with on a daily basis just because they are women, and then of course hearing about all the awful things said in response to people tweeting under that hashtag. Then Thursday I read an article about how a large group of 50 or so teenagers after being kicked out of the Druid Hill Park pool crossed the street to the reservoir and stole all the bikes used for the Ride Around the Reservoir program put on by the city effectively ending the program for the year if not forever. I walk around the reservoir frequently during the warm weather months, and though I have never borrowed a bike myself I loved seeing people riding around the reservoir on those cruisers from individual adults to families riding together. It was was always a program I thought was great and now thanks to some punk kids who have no respect for anyone else it’s gone. So needless to say by the end of the week I was feeling pretty awful and hopeless about the world. Pretty much all of these things are systemic problems deeply rooted and not easily eradicated, and they all just make me feel helpless to do anything about them. But then because God is good the sermon at my church this morning was literally about these things. It doesn’t happen often, but occasionally I go to church and think wow that sermon was exactly for me today and today was one of those days. We’re in the middle of a sermon series entitled Reconciliation and today the pastor talked a lot about almost all of these issues that have been weighing on my heart this week. It is not God’s plan for people to be divided by race, by gender, by economic level, or by anything else. There is nothing easy about the task we have been called to, but as God’s people we are called to reconcile with those around us. There are no easy answers and no easy ways to solve all of these problems, but I do not need to feel helpless and hopeless about them because there is a power greater than myself at work and I just need to do my part in bearing it out. I’m not sure what that means for me going forward at this point, but I do know that the defeatest attitude I had about all of this earlier in the week is not it. If nothing else I can work on loving other people no matter who they are and no matter what differences there are between us.